Science is the supreme authority in society. If there is a dispute, science arbitrates it. If a law is to be passed, science must ratify it. If truth is to be taught, science must approve it. And when science is ignored, storms of protest are heard in the media, the university and local coffee shops. Yet a society ruled by science (and the naturalistic philosophy that undergirds much of it) faces major problems. Science speaks so authoritatively in our culture that many are tempted to use its clout to back claims that go beyond the available evidence. How can we spot when such ideological sleight of hand has taken place? More importantly, while we may learn a great deal from science, it does not offer us unlimited knowledge. In fact, most scientists readily acknowledge that it cannot deal with ultimate purposes and meaning in life. So to what authority will we turn for these? The deficiencies in science and naturalism call for a cognitive revolution, a fundamental change in our worldview and thinking habits. And it all begins with the Wedge of truth. 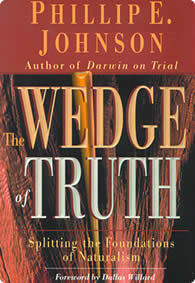 The Wedge of truth does not abandon a foundation of rational thought but acknowledges that reason encompasses more than science can provide. Johnson wants to put back on the table for public debate issues that have often been ruled out of court. In splitting the foundations of naturalism, Johnson analyzes the latest debates about science and evolution. He incisively pinpoints philosophical assumptions and counters the objections to intelligent design raised by its most recent critics. In the end, Johnson prophetically concludes that the walls of naturalism will fall and that the Christian gospel must play a vital role in building a new foundation for thinking--not just about science and religion but about everything that gives human life hope and meaning. This is a book for anyone who thinks these foundational questions are important and who would like to be an informed participant in the ensuing public debate. This page was last modified on 9 January 2007, at 19:07.